With its mild flavor and creamy texture, puréed cauliflower makes an excellent substitute for mashed potatoes. This recipe has the addition of crispy bacon, cream cheese and parmesan cheese for a beefed-up twist on regular mashed potatoes. This loaded mash is divine with grilled steaks or salmon, it’s so good that soon you’ll soon be adding bacon and cheese to all of your dishes! *If you are making the mash to use for a pie topping such as Sheppard’s pie, omit the heavy cream for a firmer texture. 1. Cut the cauliflower into florets, discard the leaves and stem, and boil in salted water for approximately 20 minutes until tender. Drain the cauliflower well and pour the water out of the pan (excess water in the cooked cauliflower can make the finished mash too soft). 2. Place the drained cauliflower back in the pan and stir well for two to three minutes over medium heat to dry it out more. 3. Place the cauliflower, butter, and cream into a food processor and blend until smooth and creamy. 4. Season well with plenty of sea salt and freshly ground black pepper. To serve, place the mash into a large serving bowl and sprinkle with freshly ground black pepper and a few slices of butter. If you would like plain cauliflower mash, then stop at this point. 5. 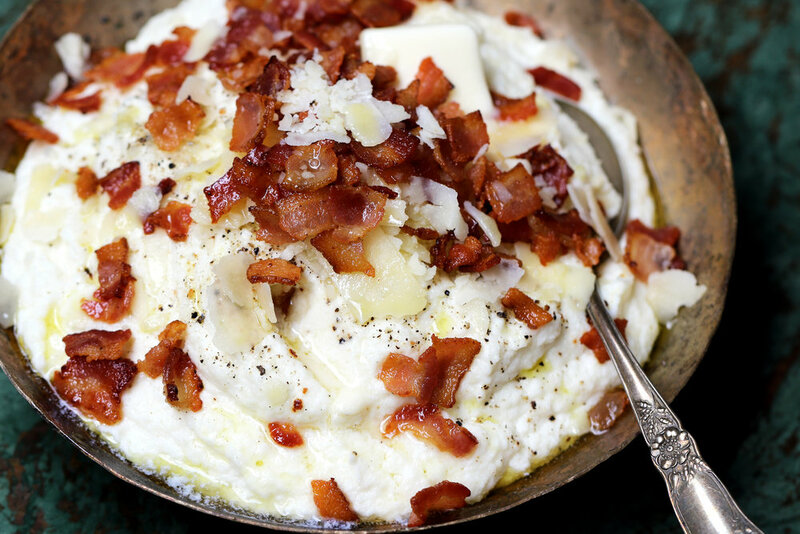 To load up your cauliflower mash, add the cream cheese, parmesan and cheddar cheese at step 3, then slice the bacon into small pieces and pan fry on a medium heat for approximately 5 minutes until crispy, drain onto paper towels and sprinkle over the cauliflower mash. Garnish the cauliflower mash with freshly ground black pepper, salted butter and extra parmesan shavings. This dish can be made in advance and reheated in the microwave or on the stove over low heat (stir constantly).